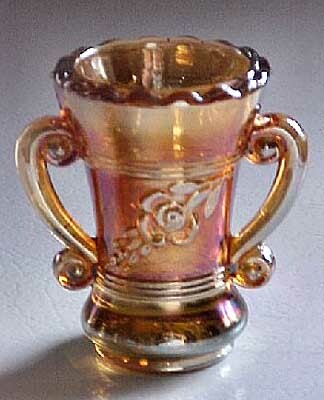 When I spotted this piece on eBay in 2004, I assumed it was an unlisted toothpick holder. After including it in my Recent eBay Sales list, Jane Stockdale emailed to say she had found it in a reference book listed as a Rose Sprig miniature loving cup, so that's what I'm calling it. It brought $285. It is 2 3/4 inches tall and 2 inches across the top according to the seller, Linda Cole, who acquired it in a flat of toothpick holders bought at an Indiana country auction. Apparently the third one known. In 2008, another in marigold sold a live auction for $45.